Penn Profiler assigns most commonly required University training. If you need to add a required course or training assignment, update your Penn Profiler assessment. To request removal of incorrect training assignments, please submit an electronic support request to the Knowledge Link Helpdesk by clicking here. For guidance on the SmartForm, see this FAQ. If you're not seeing Penn Profiler as having been completed, it may be because Penn Profiler works by sending a completion message every four hours, 4, 8, and 12 AM and PM. Until one of these times occurs your Penn Profiler will show up as incomplete. Courses assigned by Penn Profiler are handed out on a similar schedule. For courses they are assigned every 2 hours at 2,4,6,8,10,12 both AM and PM. ►▼Who needs to take the Penn Profiler assessment? Completing the Penn Profiler assessment is expected for all full- and part-time University faculty and staff active in payroll including adjuncts, CHOP affiliates, graduate students on stipends, student workers, and temporary employees. It must be completed at least annually (more often if an individual’s job responsibilities change). Penn Profiler is not required of UPHS affiliates unless they also have a position on the University payroll. Emeriti are not required to take the assessment. ►▼When and why was the assessment instituted at the University? • Strengthens knowledge of appropriate best practices that will prepare individuals to do their jobs safely and effectively. • Provides a user-friendly, web-based, self-service application to identify and assign in a timely manner task-appropriate training. • Provides the research and administrative communities with easily accessible tools to assign, manage, maintain and report training information (in conjunction with Knowledge Link). • Strengthens the University’s ability to meet ever-changing federal and regulatory compliance requirements and demands for accountability. Coinciding with this regulatory environment, research institutions have come under increasing scrutiny by federal and other agencies funding research, and the public. The risks of noncompliance are numerous, and range from heightened federal oversight and reporting responsibilities, to paybacks, fines and funding cuts, suspension / exclusion from participation in federal programs, and civil and criminal actions. Educational programs are mandated by many research sponsors, and remain a critical component of Penn’s efforts to insure compliance within the changing regulatory framework that governs research. ►▼Who should I list as my supervisor? How can I make corrections? As part of the assessment, employees are asked to select their job supervisor via a search of Penn Community. They must choose someone with an active affiliation at Penn (i.e., not an outside person). If your paid employment with the University is primarily academic in nature (for example, faculty member, graduate student), then the head of your program or department is usually the best person to identify as your supervisor for the purposes of Penn Profiler. If you are a staff member in an administrative or support position, or a student worker, the person who hired you or oversees your work is usually the best person to identify as your supervisor. Supervisor data can be easily corrected by individual users on a new "Set Supervisor" screen, available to users from the left navigation bar of Penn Profiler. Users won't have to complete the whole assessment just to update their supervisor. ►▼Why is Penn Profiler showing up as incomplete? Penn Profiler works by sending a complition message every four hours, 4, 8, and 12 AM and PM. Until one of these times occurs your Penn Profiler will show up as incomplete. Courses assigned by Penn Profiler are handed out on a similar schedule. For courses they are assigned every 2 hours at 2,4,6,8,10,12 both AM and PM. ►▼I think the wrong courses have been assigned to me. What should I do? ►▼When I log into Knowledge Link, I don't see my courses. What should I do? Courses assigned as required by Penn Profiler usually appear on your Learning Plan screen in Knowledge Link within 2 - 3 hours of completing the assessment. You should also receive a list of your newly assigned required courses in an email overnight from Knowledge Link. If you do not see your Profiler-assigned courses on your Knowledge Link screen by the next day, please fill out the support form. ►▼I got an email saying I need to retake the assessment. Why? Penn Profiler must be completed at least annually, and more often if an individual’s job responsibilities change. Annual reminders are sent automatically about one month prior to the anniversary date of the last completion. Penn Profiler also detects changes to an employee's home organization or job code, and will notify employees that have changed positions that they should retake the assessment to identify any new training that may be needed based on new work tasks. ►▼I'm a supervisor. I got an email about my supervisees' training. What does this mean? ►▼I'm a supervisor. How do I correct an error on my list of supervisees? When you open your My Team tab, you will be able to see the training records for all individuals who listed you as their supervisor when they completed Penn Profiler. If someone you supervise is missing from your My Team tab, you should tell that person to log into Penn Profiler and use the Set Supervisor screen to update to the correct person as supervisor. If there is someone on your list who shouldn’t be, and you know the person, the easiest/quickest thing is to ask the person to correct it themselves in Penn Profiler as above. If you don’t know the person, you can request the change on the online form. ►▼What do I do if I don ’t know the answer to a question? You can click on the yellow "infodots" throughout the Penn Profiler to see expanded explanations of the questions and answers. If you are still uncertain of the best response to a question, click the Help button and you will be provided with the support email contact for that particular branch. Click "Save and Exit" in order to save the work you've done in the assessment so far, and then fill out the form to send your question and wait for a reply. After you receive the advice you need, return to Penn Profiler and resume the assessment. ►▼I completed the CITI training at CHOP. Do I get credit for that? How? If you are a Penn faculty member based at CHOP and have completed CITI training through CHOP, you do not need to repeat the University's Human Subjects training. Contact the Office of Regulatory Affairs (irbciti@exchange.upenn.edu) regarding reciprocity for CITI. ►▼When I click on the link to take the Penn Profiler, I get the message that I’m unauthorized. What should I do? Anyone who is qualified to access Knowlege Link can take the Penn Profiler. However, if you see a message saying you are not authorized for Penn Profiler, most likely your status with the University has not resulted in an account being automatically created in Knowledge Link. If you are actively working at the University and need to take Penn Profiler, please fill out the form to request help. ►▼How is this information used? The responses to the Penn Profiler assessment questions are used to make course assignments for required training in Penn's administrative Learning Management System (LMS) called Knowledge Link. 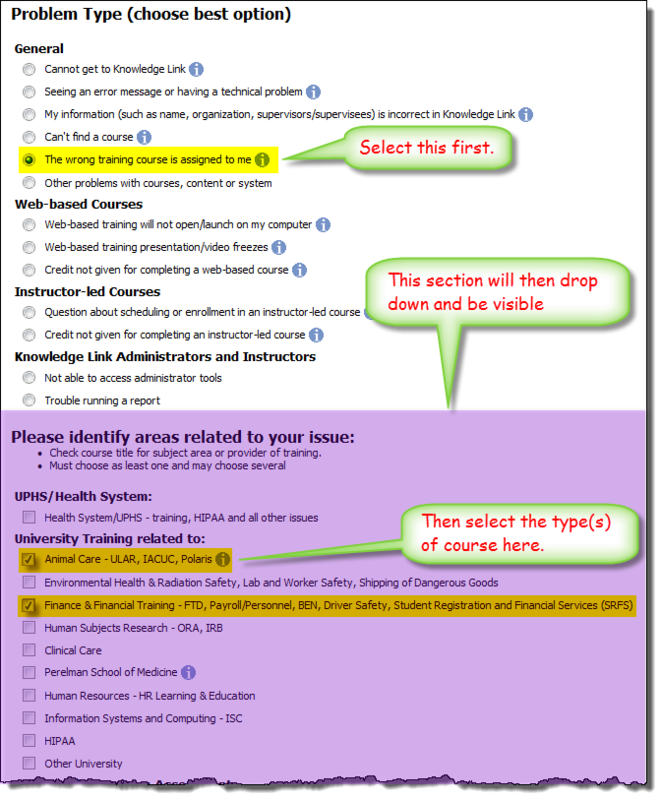 Once you complete the Penn Profiler assessment, the courses that have been identified based on your answers regarding your work at the University will appear on your Learning Plan screen. You can register for the classroom or web-based training classes from Knowledge Link to complete your training. ►▼Are my responses to the assessment questions private? The responses to the Penn Profiler questions are connected programmatically to certain course assignments. For instance, if you indicate that you work with certain types of radiation in a laboratory setting, you will be assigned the relevant radiation safety training. Your answers are stored in a database and can be viewed by system administrators, and by your supervisor at their request. The status of your required courses that are assigned by Penn Profiler, and your other training in Knowledge Link, can be viewed by your supervisor through the My Team tab in Knowledge Link. ►▼The font size of my assessment is too small or large. How can I fix this? To make the text of the assessment more visible, please adjust the font size on your browser. In Firefox or Chrome , you can temporarily increase/decrease the font size by holding down the control key and clicking the + or - keys. ►▼Can I delegate my supervisor responsibilities? At this point in time, only PSOM supervisors can use the 'delegate' option in Knowledge Link. This option is useful if the supervisor will be out of the office for a period of time. The delegate will be able to monitor important training information in the supervisor's absence.